The Beagle is alert, bold, active, eager and affectionate. Beagle's can be stubborn dogs, but have the intelligence to be trained, if done in a firm manner. They still have pack instincts and enjoy being socialised with other dogs or beagles for pack activities. Beagles make great family pets with their cheerful and gentle nature and tolerance of other pets and children. 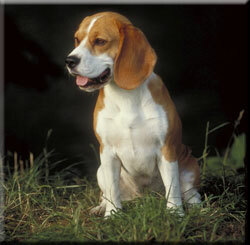 The coat of a Beagle is waterproof and is able to drip-dry easily and dirt can be sponged off with ease. Beagles need a considerable amount of exercise. They are not recommended for a flat or apartment home. The Beagle is believed to have evolved from the old Talbot or Southern Hound in France, these hounds made their way over to Britain. Originally there were two kinds of scent hounds in England, large ones who hunted deer and small ones known as 'begles' who hunted rabbits. Thus, just as Harriers are a smaller version of the English Foxhound, the Beagle is a smaller version of the Harrier. General Appearance: Well proportioned, compact, muscular, active and exuding strength and energy. Color: Any hound color, except liver. Tip of the tail is white. Coat: Short, dense and weather resistant. Tail: Moderate length, set high, tapering, carried gaily but not curled over the back and longer hair on the underside. Ears: Long, flat, set low, round tip and hanging. Body: Short, straight, muscular back, muscular thighs, ribs well sprung, loin powerful and extending right back. Beagles may become destructive and howl if bored and not kept occupied. Beagles make great household members, as they naturally enjoy being part of a team and the family becomes part of their pack. © Copyrighted by dooziedog.com 2005 All rights reserved. © 2019 dooziedog.com - All rights reserved.